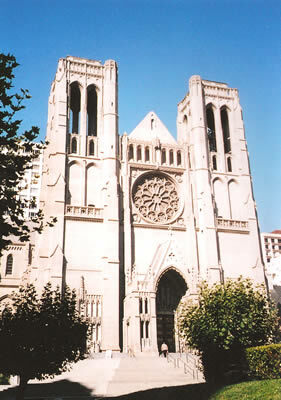 Grace Cathedral in San Francisco is a fine building. The picture I reproduce here is of its west front. But it is the interior which really delights me. It is, like those of most churches in California, pristine and well cared for. Yet it is unfinished. Look upward, and you will see that the stone vaulting was never completed. This means that there is darkness way overhead. The consequent effect is rather like that inside Westminster Cathedral in London (where, thank goodness, the vast domes were never covered with their intended mosaics): a sense of mystery and ‘other-ness’ hangs over the holy space and makes your spirit drift heavenwards. And what do these musings have to do with restaurants? Well, after Thursday’s choral evensong at Grace Cathedral, you will need some good food – so you might well walk the short distance to one of the city’s finest dining rooms, Masa’s, at 648 Bush Street. I did precisely that, and was greeted by Todd Stillman, the restaurant’s General Manager and Maitre d’. Mr Stillman is a most affable fellow. He showed me to a large table with a white tablecloth. Riedel glasses, of the Vinum range, and a vase of pretty roses stood waiting for me. Canned jazz music, played at a modest volume, seemed right for this dark, intimate space. 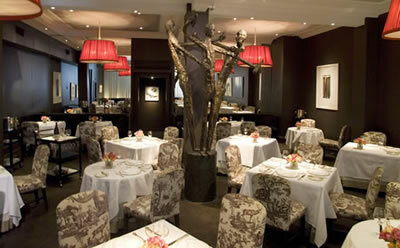 My eyes settled upon the sculpture in the middle of the room, ‘Les Muses de la Cuisine’ by Albert Guibara. Spotlights shone down upon waiters in black and upon my well-dressed fellow diners. (It pleases me when I see that I am not the only person to have made an effort over my evening attire.) 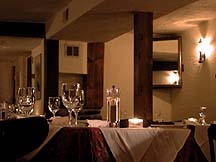 The setting, then, was modern and sophisticated. The stoves are now manned by Chef Gregory Short. He has some distinguished predecessors – Julian Serrano, Ron Siegel and the eponymous Masataka (tragically murdered in 1984, just a year after the restaurant opened). Mr Short, who has worked with Thomas Keller at The French Laundry, earned my admiration. His approach is to apply French technique to American ingredients. I can testify that he seeks out produce of the finest quality and handles it with skill and intelligence. My opening ‘Celebration of tomatoes’ was aptly named. Its various kinds of fresh tomato and tomato mousse were delicious, and well combined with the tastes of parmesan cheese and balsamic vinegar. Even better was the basil ravioli (white corn polenta, with mascarpone cheese, sweet cherry tomatoes, parmesan and tomato water emulsion). This translucent pasta caressed my mouth with its gorgeous flavours. I could easily have eaten nothing else throughout the meal. But I was glad I had kept room for the pan-seared New York striploin beef with a truffled bordelaise sauce. Tender and tasty, this was really good meat. Finally, to add some fun to the proceedings, I chose for my pudding, ‘Cracker Jack’. This combination of popcorn sherbet, chocolate sponge, peanuts and caramel might not have reduced my waist measurement, but it certainly brought a smile of satisfaction to my face. I selected these 4 courses from the carte. With a $10 supplement for the beef, they came to $93. 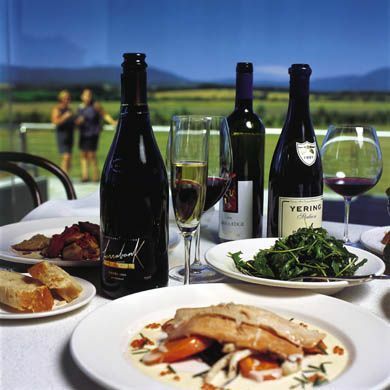 A 6 course tasting menu is available for $90 and a 9 course one for $120. Given the quality of the food, these prices are very reasonable. Nine hundred wines are offered on the list. Overseen by sommelier Alan Murray, a knowledgeable Australian from Sydney, this is a cellar which pays due homage to the Old World. From Spain comes 1989 Vega Sicilia Unico ($448), from Italy comes 2000 Ornellaia ($400) and from France come stars like 1964 Haut Brion ($600), 1988 Pétrus ($1,600) and 1966 Moët & Chandon ($900). Good to see, too, 5 Dönnhoff rieslings from Germany. For my white, I tried one of the new-style German rieslings, beautifully made – with an intriguing mixture of mineral and toast and with just the slightest hint of petrol (Keller, Westhofen Kirschspiel Riesling Grosses Gewächs, 2004 - $148). My red was from Tuscany and thrilled me with its depth of ripe black fruit (Siro Pacenti, Rosso di Montalcino, 2003 - $64). I predict that, like me, you will drink well at Masa’s. The choral singing of men and boys is one of the glories of the Anglican tradition. You will find it at the Thursday evensong at Grace Cathedral in San Francisco. As you listen to the soaring voices and gaze up at the unfinished vault, you can be sure – if you have secured your reservation – that the dinner which awaits you at Masa’s will be another treat. 648 Bush Street, San Francisco, California 94102, U.S.A.